I’m afraid that if I bake one more batch of Christmas Cookies my ears might start turning pointy on top. I set today aside to do nothing but bake. Little did I know my kitchen would end up turning in to a cookie workshop. 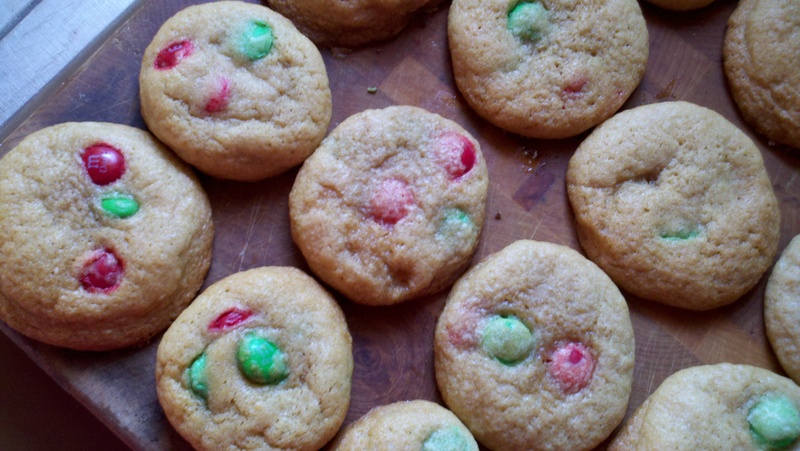 Sugar Cookies, Peanut Butter Blossoms, Italian S Cookies, and Red and Green M&M Cookies were amongst the delights coming out of my oven. I counted and all in all I baked a total of more than 600 cookies. You can just start calling me Keebler! Using a stand mixer or electric mixers, cream together sugar and butter. Add egg and vanilla. In a separate bowl mix together salt, baking soda, and flour. Add these dry ingredients to the wet ingredients and mix til well combine. Stir in M&M’s by hand. Drop Tbsp-fulls onto an ungreased baking sheet and bake at 350 for about 7 minutes.